1. Why was Great Britain seen as one of the most powerful nations in the world after their victory in the French and Indian War? Use the following links and Proclamation Line map to complete the group activity. See teacher for details. King George issues the proclamation declaring that colonist may not settle west of the Appalachians. 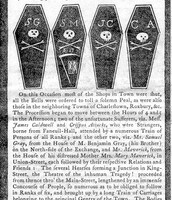 Colonist disregard the order of the king and cross the Proclamation Line anyway. 2. 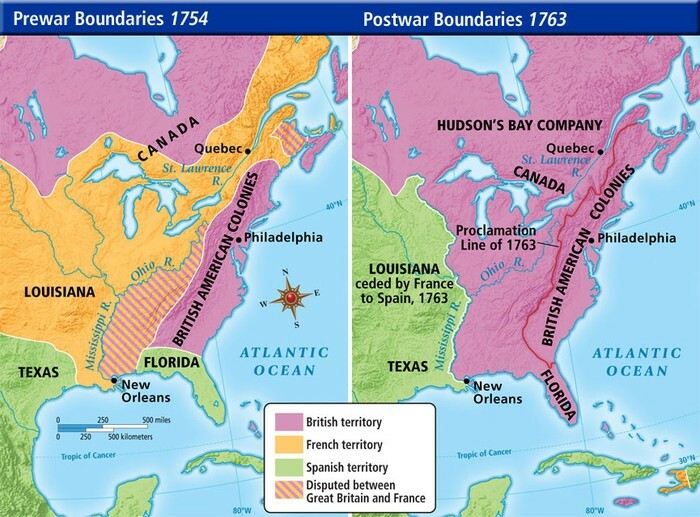 How did North America land claims change between 1754 and 1763? 3. In your opinion, what could have caused these changes? 4. How will the expansion of British territories impact the future of the Colonies? 5. How do the colonists respond to the Proclamation of 1763? 6. 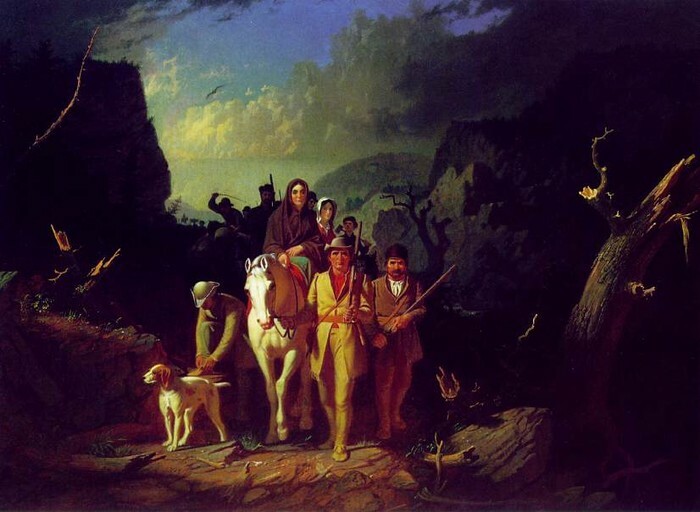 What is the connection between the French and Indian and pre-American Revolution events? 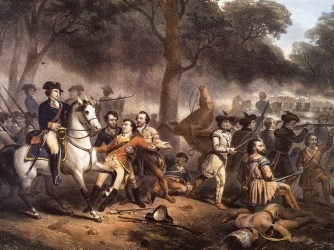 A series of taxes were imposed on the colonists by the British Parliament in order to pay for debt incurred during the French and Indian War. 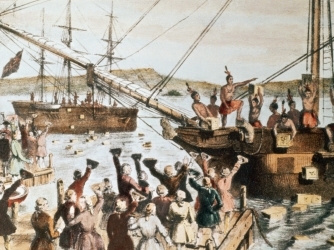 The crown also needed to pay for troops stationed both in the 13 colonies and the West Indies. 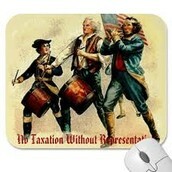 These taxes were passed without first consulting the colonists. This didn't go over well. 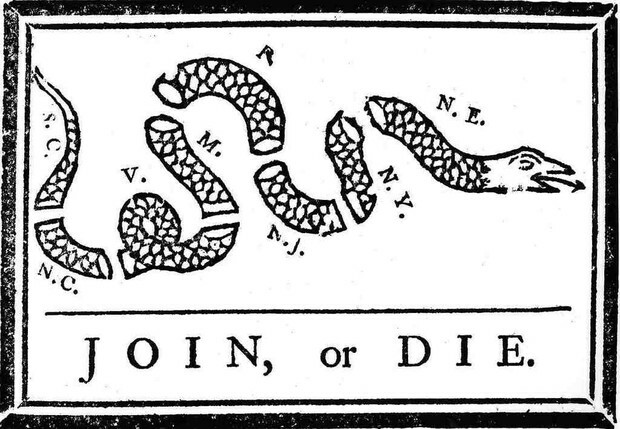 First, research the Proclamation of 1763, Tea Act, Stamp Act, Quartering Act, and Intolerable Acts. Research data should include the date, a summary of each event, and the key individuals involved in each event. Using this information, and information that you learned about the Proclamation of 1763, you will create a foldable for organization and review. See teacher for details. 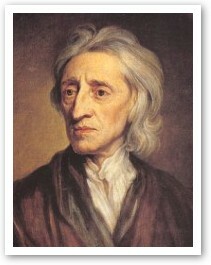 Enlightenment philosopher and political theorist, believed that government was a "social contract" who's purpose was to protect individual freedom and property. 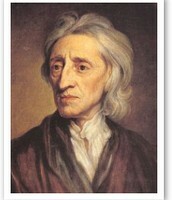 If it failed to do this, Locke believed the people had the right to overthrow it. 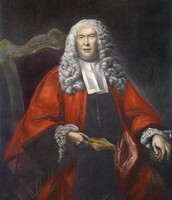 British jurist who defined the rights of individuals and property rights that could not be violated, even by the king. 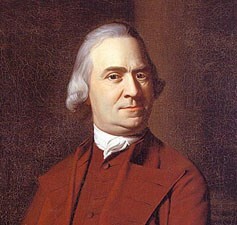 Cousin of John Adams and member of Boston's Sons of Liberty, he believed that government had no right to tax the colonists without their consent. He and many colonists believed that "taxation without representation" was "tyranny." 7. Considering the fact that the colonists were still British citizens, and British citizens living in Great Britain paid taxes, was King George III justified in placing taxes upon the American colonists? Justify your answer with evidence? 8. Who are the individuals involved? 9. What is happening in this clip? 10. 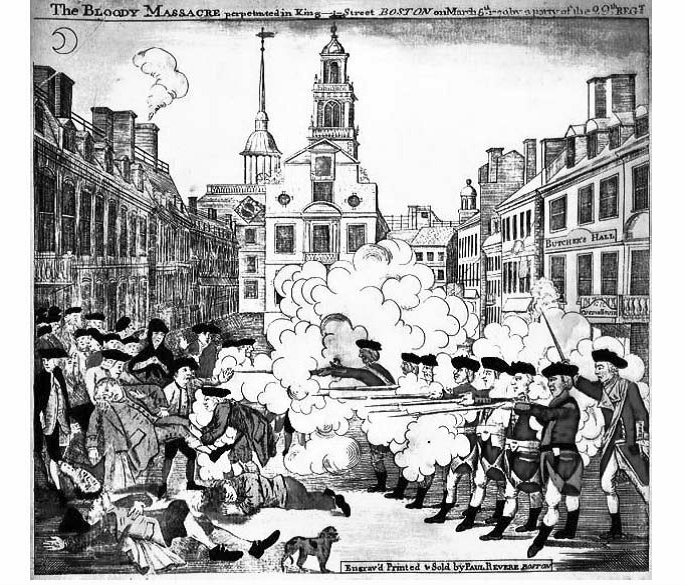 What might happen as other colonists find out about Boston Massacre? 11. 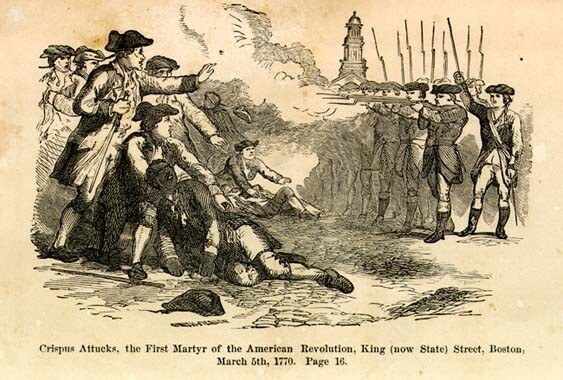 How will the news of the Massacre reach the citizens of the 13 Colonies? Civil Disobedience: Refusal to obey a law which you believe to be unjust. 12. Why did Revere create this engraving? 13. What is his message? 14. Read the text of the image. 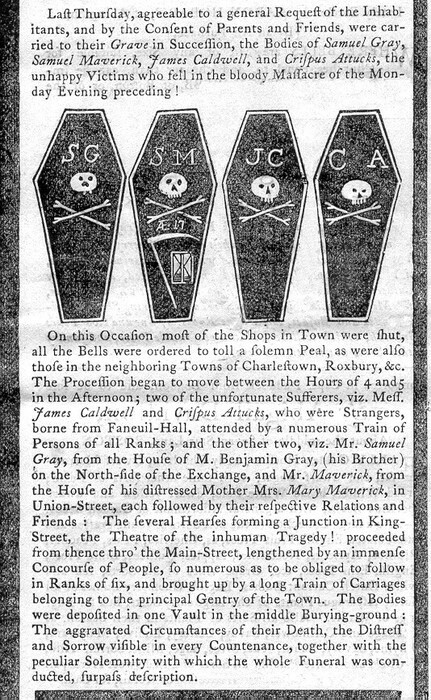 Keep in mind this is written in English script so the “s” looks like an “f.” What is Paul Revere’s intent with this engraving of the coffins? 15. How and why is this image different from image 1? 16. Why did the author focus on Crispus Attucks in his image? 17. Was Franklin's cartoon propaganda? Why or why not? 17. What is happening in this clip? 18. 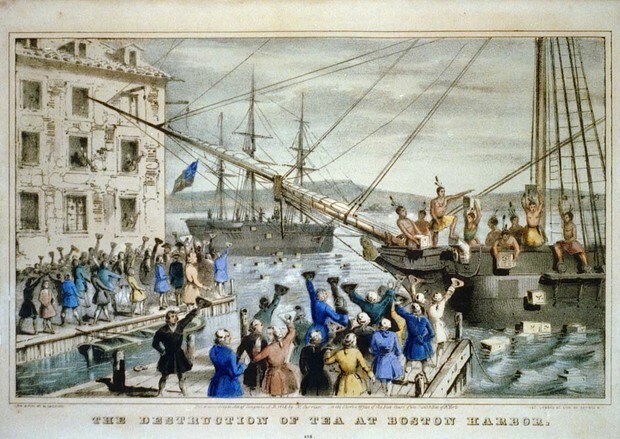 What is going to happen as others find out about Boston Tea Party? 19. How will the King react? 20. Is this an example of civil disobedience, or would you consider this an act of violence? Why or why not? 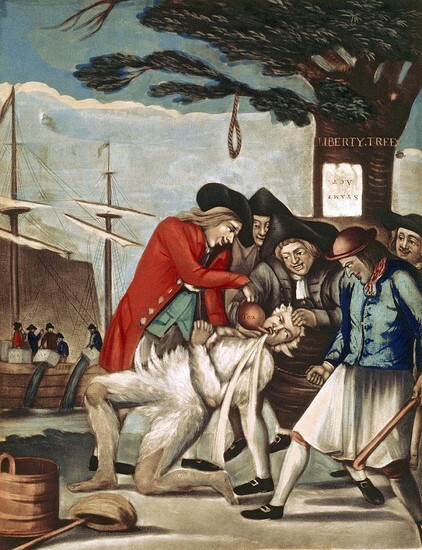 Find out more about the Sons of Liberty, a defiant and radical group of young men as they band together in secrecy to change the course of history and make America a nation. Take a look at the two images below. Decide if they are examples of civil disobedience or violence. Loyalists: Colonists who remained loyal to the Crown. 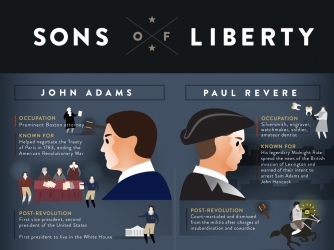 Patriots: Colonists who sought independence from England. Which side do you think that you would have chosen? Consider the risks involved with opposing the greatest power in the world and the potential loss of everything that you have worked for. 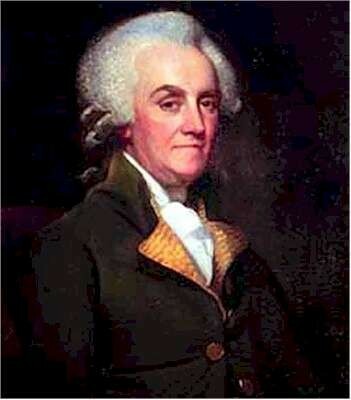 William Franklin was a loyalist. His famous father helped him gain a position in New Jersey working for the king. 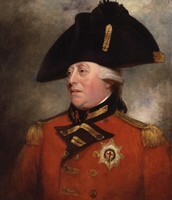 When the colonies neared revolution against the crown his father asked him to become a patriot like himself. William chose to remain loyal to England. After the Revolution, William was imprisoned for 2 years and disowned by his father. They never patched things up. Who do you think William's father was? As a colonist, write a letter to King George. 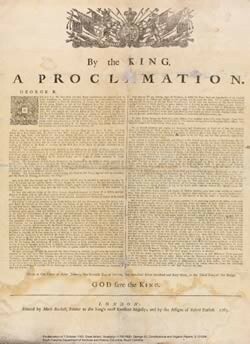 The letter should address the effects of the King’s taxes and laws in regards to the colonies. Your letter should provide specific details and examples of these effects. 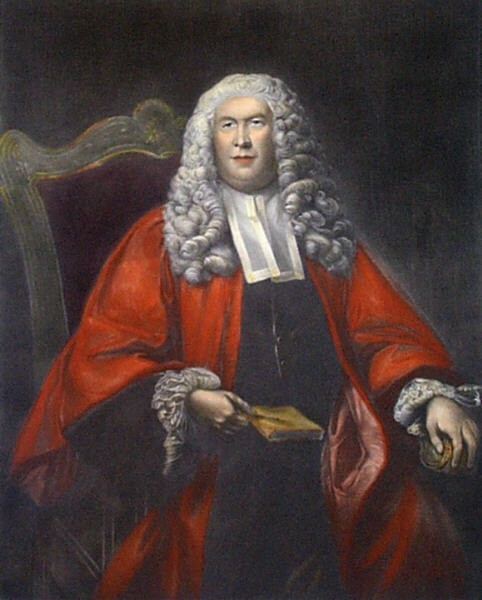 These effects could include the inability to move West (Proclamation of 1763), lack of privacy and invasions of homes (Quartering Act), excessive taxes (Stamp and Tea), and the restrictions of local governments (Intolerable Acts) as well as the lack of representation in Parliament (no taxation without representation). The letter should be written in proper letter format and contain accurate historical facts.